Look what the amazing Natalie accomplished in less than five hours. Uh oh, I may have broken some child labor laws. Nat is such a great worker and easy to hang with. 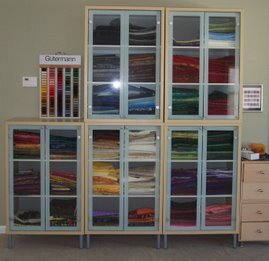 We listened to music, chatted, and I am just thrilled with how my fabric cabinets look! If you are thinking the top right shelf doesn't look as nice as the others, that's because it the one I did. When Natalie finished with fabrics, we decided to try a couple of Mors Bags. I had some all cut out, complete with handles. Within 90 minutes Natalie made two bags, sewing through the handle fabric nicely and French-seaming both bags. When she heard that the September Chicago Modern Quilt Guild meeting is devoted to making bags for the Chicago Food Depository, Nat asked if she could donate one of the bags she made. What a girl - I love this child! My granddaughter Natalie will be 12 next week. To celebrate her birthday she's going to participate in a Zookeeper Experience at Brookfield Zoo with the dolphins and will actually be a part of the 11:30 show on Sunday, August 26. This amazing opportunity is expensive, and Nat's been looking for a way to earn some money. Guess who just happens to have fabrics that need to be organized? Each one of these pictures makes me so happy. (I cannot believe that I never blogged about this piece that was finished last December. I fear it got lost in the Christmas rush...) In August 2011 my Chicago Modern Quilt Guild began a Round Robin, based on an center block of applique, something we learned at the July 2011 meeting. My 8" square applique block involved this small series of circles on an oldd gold background. Round Two was rectangles, and Rachel added her lovely neutrals. Round Three was diamonds. Sarah S searched through her stash and found these lovely fabrics that read "oriental" and added the diamonds. Round Four was curves, something that ofen strikes terror. Holly added these gentle curves in more neutrals, really keeping the eye the the center block.Round Five, the final round, was triangles, and Sue R, whose brainchild this Round Robin was, did triangles, using her signature black and white fabrics while keeping the integrity of this piece. Then it was back to me to quilt it. Sarah S passed along some of her fabrics, and I used some of them to create a bottom horizontal border. 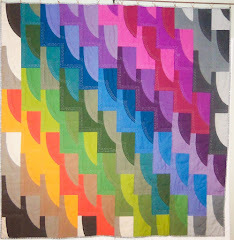 The quilting just emphasizes the lines of the various rounds. It is 21" x 24". I love this piece. And I love the thought that each quilter put into her round. The design is something I would have never chosen, but I do love it and am proud to have such a lovely collaborative work in my studio. Sue also created a little booklet to go with each quilt so that each contributor could write what she was thinking as she worked on her round. No matter what size a bag is or how long the straps are, it's not right. And that's ok. It's all about what works for an individual. Friend Janet likes a bigger clutch so that it holds her phone, among other things. Friend Vinnie likes them small. So here's the current crop of zippered pouches. 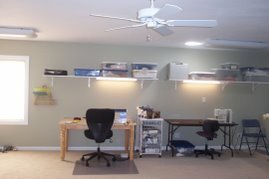 Everything is put away, and I'm switching over to a commission with a mid-August deadline. What a great use of scraps and bits! I gave my oldest friend Cathy (we grew up together in Western Springs) a bag for her birthday. She travelled with it, and her travelling companion really liked it. So Cathy has ordered one for her. My friend Vinnie has ordered several little small pouches. Those are next! Three of my guildsters came over today to make zippered totes. We started around 10 and finished at 4, and we were all smiling. Nice work, ladies! What's the best way to show a finished quilt? Certainly flat on the floor doesn't work that well. And it's so much time to hang a quilt on the wall. Since the design I used was from Quilts Made Modern and since it is their cover quilt, I tried to duplicate their photo styling. Ok, ok - I didn't try that hard. But this photo does show off the individual fabrics a bit better. These fabrics were all bought in Jasper, Alberta in May when John and I were touring the Canadian Rockies, thus its name: Canadian Rocky Mountain High. My Canadian Rocky Mountain High quilt is finished. Odd that I'm finishing up a quilt for me when it's in the 90's outside. But someday it will be cold. And my house is a cold house. This 60" x 80" napping quilt will be perfect for my reading chair on those chillychillybrrrrrbrrrr days. The quilting was done by T and F Quilting Studio in Lemont. They do such nice work. I hope you can see it in the picture below. This pattern is Beach Glass by Weeks Ringle and Bill Kerr from their book Quilts Made Modern. 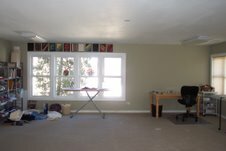 My Chicago Modern Quilt Guild has a new challenge going on, a modern art challenge. Those of us participating have been given a piece of art and a couple of fabrics, and we are now to make a piece of quilted art. This project is due in August, and I'm sure I'll blog more about it. My volunteer involvement in the Alzheimer's Art Quilt Initiative means that I'll be having people in the studio on a regular basis, and this week I am also doing a play day with a couple of my quiltsters. This means I'm going to have to start living and working a bit differently in the studio. This reversible ROYGBIV tumbling blocks is almost done and not in too many parts. So that has come out of the box. And really. I need to finish this one away. Last February my Chicago Modern Quilt Guild devoted its meeting to the Alzheimer's Art Quilt Initiative. I was amazed at the quiltlets that my guildsters created. Eileen's moved me so that I had to buy hers. My mom's and my family's struggle with her Alzheimer's is a path that must be walked one day at a time. No medications have been useful, and she needs constant supervision. I don't know whether it's medical research or social assistance that is needed more, but I responded on a pretty deep emotional level to this grass-roots fund-raising organization AAQI. So I have jumped into volunteering for the AAQI organization. My small role among a small sturdy army of volunteers involves scanning each group-made quiltlet and emailing a quality photo that can be used for the AAQI website. Sounds easy. But of course there were hardware issues. My laptop and the wide-format scanner needed several hours of warming up to one another. Now, they are friends. And the software is PaintShopPro - not impossible to use but certainly almost beyond my capabilities. My shoulder-companion in this venture is my quiltster Eileen - working with her is a joy. So far we have spent 8 difficult hours working on this new software, and we have finally cracked it. We will need to spend two days a week in hot pursuit of the boxes of donated quiltlets that are lining the studio stairs. Over 11,000 quiltlets have been donated to AAQI, and the amount of money raised has come from the emotional depths of so many women, all of whom have been impacted by Alzheimer's. I'm feeling good about this past week.